Every summer, I rent a house on Fire Island with a bunch of friends, and it's one of my favorite things ever. If you've never been to Fire Island—we rent in the mellower western part of the island, not the party-party Pines—it's one of the most relaxing places on earth. There are no cars and there's not much to do (other than go to the beach, go to the grocery store, or take a bike ride), which makes it perfect for overstimulated, stressed-out New Yorkers such as myself who need to chill the eff out. Of course, the best part is being able to spend quality time with my friends, and I love checking out the ladies' vacation-wear. Last weekend, my friend JO broke out a fabulous caftan that she bought in Thailand, and all of a sudden, my go-to Calypso cover-up started looking like a has-been. So before I head back out for a full week of pure laziness, I'm vowing to outfit myself with a fabulous caftan. Here are some of the contenders. I've been meaning to write about Show Me Your Mumu for awhile—the line was created by two former New Yorkers who sound like the most kooky, fun girls ever. They make easy, breezy printed pieces from tank tops to pants, but of course they excel at their namesake, the Hana TruMu. It's packable and wrinkle-free, and if that print doesn't make you think beach, then I don't know what will. L'attitude is one of my favorite sites for jewelry and accessories; everything they carry is very "Oh yes, I picked this up in Goa," except you don't actually have to go anywhere. Yay Internet! Anyway, they have all manner of fabulous coverups, but this mermaid caftan from Beach Candy is one of my favorites because the print looks like fish scales and thus fulfills my Ariel the Little Mermaid fantasies. I rave about Mara Hoffman's prints every Fashion Week, and if you think they look great on a runway, imagine how mind-blowingly cool they'll look on the beach. 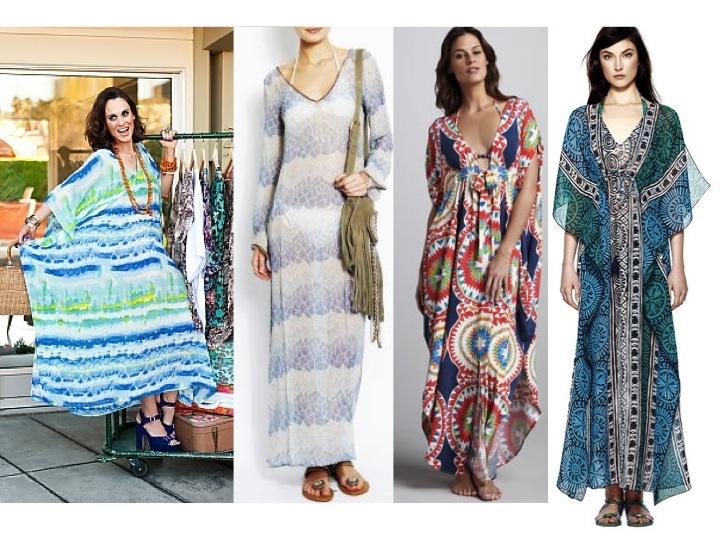 Cool kaleidoscope prints like the one in her Pow printed coverup are practically made for caftans, aren't they? Pass the umbrella drinks. And speaking of ladies who know how to vacation, would you expect anything less than this Tofino long caftan from Tory Burch? She really stepped up the game with this one—it's silk, and it looks like something you'd see in an old Slim Aarons photo. It's also dry-clean only, which means you might not be able to actually wear it on the beach, but it's so chic, you could get away with wearing it pretty much everywhere else.